fern, originally uploaded by jahansell. Everything is blooming, emerging, growing so fast - blink and you miss the moment! 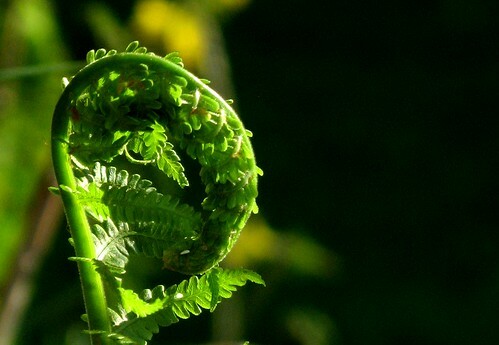 I love the way ferns unfurl their leaves. I was away from home most of yesterday and this morning there are so many new things to see in the garden...as you rightly say "Blink and you miss it"
that is so true, Jenny! good thing you captured this on cam. I saw a post yesterday of these cut off and sold in a store. I never knew you could eat them. Nice close-up. I wanted to thank you for your visits to my blog. Thanks. Great shot! I like the play of lights and shadows, and this baby-fern (?) is charming! It makes me think of sea-horses. It is unusual. My eyes stay wide open, but there is almost nothing around here happening on the nature front to see.....:-((. there Is no nature front.